What is the benefit? If you could sum up the most important qualities in a fertilizer for your recreational or commercial landscape, what would they be? Finally, here’s a product that does all five. Biosol® is achieving outstanding results in creating and maintaining healthy turf at golf courses, public parks, recreational and sports facilities, home and commercial lawns throughout the world. Biosol® provides all except the two climate controlled ingredients for a healthy landscape. Sorry, we can’t do it all! Many lawn care companies incorporate Biosol® mix into their existing four or five step fertilizing programs. Biosol® works very well as long as the first application is the heaviest. With Biosol® and its repeated use, as a home owner you will find that you will fertilize less often and, in some cases, you may only have to fertilize once a year. Depending upon your application rate, Biosol® promotes one to two fertilizations per year rather than the traditional one to two times a month. 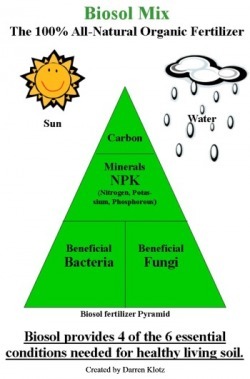 Since you are using quality nutrients to feed your plants and turf with very little leaching, you receive benefits from your fertilizer year after year. Biosol® promotes the humus formation and soil fertility due to the 70% organic substance. Biosol® activates and regenerates the soil with the lasting effect. Higher humus values, better rooting and vitalization are specific characteristics of a premier organic fertilizer. The beneficial bacteria, and beneficial fungi of the soil release the nutrients in accordance with the demand of the plants. The plants are perfectly nourished and there is little danger of nitrogen leaching. This unique blend of nutrients enables Biosol® to stimulate root development, allowing plants of all kinds to fully absorb essential nutrients for longevity and maximum health. Biosol® is a 100% organic, long lasting fertilizer with soil improving benefits. The balanced nutrition ratio supplies the plant with micro- and macronutrients throughout the growing season. The high organic material in Biosol® improves the humus content, providing quality nutrients for the plant and the soil. By building the organic matter and humus, it helps the soil to become active and prosperous, allowing the nutrients to be available for root absorption. The soil is enriched, rooting is strengthened, the growing and vitality of the plant is increased, and the plant’s resistance against disease is strengthened. Biosol® is low in salt and is suitable for arid or low precipitation areas. Because of the organic fixation of the nutrients, plus nitrogen, the risk of nitrate leaching is very low, providing the ultimate use of nutrients by the crops. Biosol® is a safe and ecological fertilizer because of the selected organic materials and is safe to use around children and animals. As an all-natural organic fertilizer, Biosol® performs in harmony with the environment. There are no chemical byproducts emitted into the air or leached into the water supply. Because it is 100% natural and environmentally balanced, Biosol® promotes good health for both plants and soil. Biosol® was developed in much the same way as slow release vitamins. This slow release formula will not burn seed or existing vegetation and does not require watering immediately after application. Nutrients are released continuously throughout the growing cycle, reducing maintenance costs associated with lesser quality fertilizers, which require numerous applications. Because of its low pH, nutrients are more readily available for plant uptake, rather than being bound in the soil. One of the key factors of Biosol® is its ability to promote a healthy balance of microbes, insuring the long-term health of your plants. This unique blend of nutrients enables Biosol® to stimulate root development, allowing plants of all kinds to fully absorb essential nutrients for longevity and maximum health. Biosol® enriches the soil, enhances the volume of positive microbial biomass, and promotes the formation of humus, all of which results in a healthier and stronger plant. Biosol® has a harmless, typical fungal smell that disappears a few days after application. Unlike many natural fertilizers, Biosol® is easy to transport and use. The product is packaged in sturdy plastic bags which may be recycled. Biosol® is granulated and suitable for all standard application methods.